PhotoGridPro is a photo collage app which lets you create photo collages and then allows you to edit and customize those to make them more beautiful. These collages can then be directly uploaded to Instagram, Facebook or Twitter. You can also email them or save to your camera roll. Easy to use Interface: It’s very easy to use PhotoGridPro and you won’t need any kind of help while you design and customize your photos. Several Photo Collage Grid Templates available: There are 18 photo collage grid templates to choose from. Mix and Match the photos the way to like. Customizable Grid Template: After you choose any of the available photo grid templates, you can customize it further. You have options to adjust the frame horizontally, vertically, manage rounded corners and change the frame size. Color and Textures of the frames can also be changed. 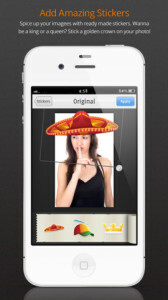 Easy to add photos: Simple click on the photo grid will open up camera roll from where you can easily choose the photos. Edit the photos: You can easily crop, adjust brightness, sharpness, contrast of the photos. Add Cool Stickers: I personally liked this feature and was able to highly customize my photos by adding cool stickers like caps, hats, goggles, moustaches, cigar, speech bubbles etc. You must try this option. Add Effects to the photos: There are so many options available to edit, add effects or change the appearance of the photos. Effects: Original, Singe, Vivid, San Carmen, Indiglow, Concorde, Aqua, Strato, Laguna, Ventura, B&W, Sepia, Soft Focus. Once you edit and customize your photo, it will appear in the grid template where you can then adjust the photo to appear best in the grid. You can move it by pinching in and out. After you’re done editing one photo, you can add photos to remaining grid portion one by one and then customize those as well. Share on Social Media Sites: Finally you can share your photo collage on Facebook, Instagram, Twitter. You can also send it in an email or save to camera roll. 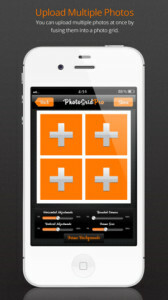 PhotoGridPro has a very simple design and ease to use features. App is primarily focused on helping you create, edit & customize your photo collages. PhotoGridPro has a perfect mix of photo collage features with highly customizable photo editing options like effects & stickers which makes it a must have app for your iPhone or iPad.